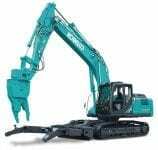 Kobelco Recycling Excavators offer all of the innovative techology that makes this brand the go to for large machines. Cost effective and with low fuel usage, see how a Kobelco Recycling Machine can help you to be more profitable. Best Warranty in the market: With a 2 years or 3000 hours full factory warranty Plus 4 years or 6000 EPT warranty we have you covered. 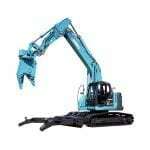 Kobelco’s innovative iNDr Integrated Noise and Dust Reduction Cooling System for ultra low noise.